An aquifer is defined as an underground layer of water-bearing permeable rock, rock fractures or unconsolidated materials such as gravel, sand, or silt, or in the case of Komin, pristine volcanic rock. This means that it is a pocket of water, hidden beneath the surface of the Earth, following years of organic filtration and enrichment through layers of natural substances. As per hydrogeology (the study of water flow in aquifers and the characterisation of aquifers), there are numerous different kinds of aquifers, such as saturated aquifers and unsaturated aquifers. The Earth’s surface has varying amounts of water, underground, at almost every location on the earth’s surface. Therefore, the Earth’s crust can be divided into two sections, the first being unsaturated zones, where there are pockets of both, air and water fill most of the spaces left empty by rocks and other natural materials. The second section is called saturated zones where naturally purified water occupies all the empty space available. It is saturated zones, that are mostly bored to extract water for human consumption. The aquifers that are home to Komin Natural Mineral Water are volcanic-rock saturated aquifer. Volcanic rocks are rocks that are united in origin but can have a wide variety of chemical, structural, mineralogical and hydraulic properties. This is due to the variations in the type of rock, and the pattern in which the lava was ejected and deposited at the time when the volcano erupted! Some volcanic rock, for example, is highly permeable and allows rain water to pass through, unfettered, some can only let it pass through fractures or cracks in it, while some are absolutely impenetrable by water. The aquifers that Komin is sourced from are a section of the Earth’s crust that is mostly made up of volcanic Basalt rock. Basalt is unique in its structure and composition, since it forms in linear columns, when magnesium rich and iron rich lava erupts out of volcanoes. It is a fine-grained rock and its name comes from the Latin translation of ‘very hard rock’. 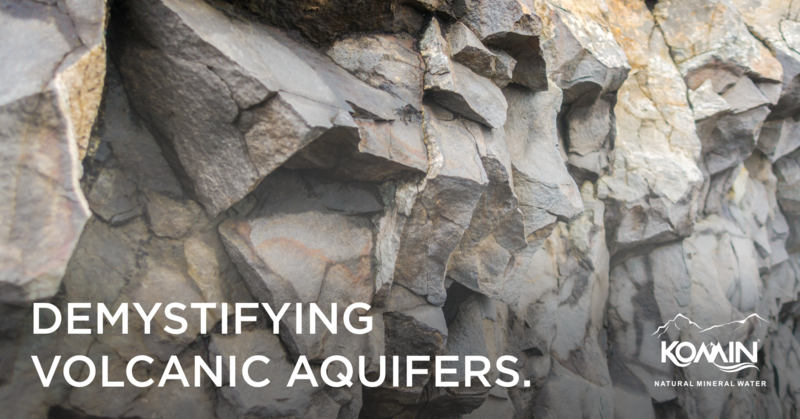 Basalt is considered to be the best volcanic rock for natural mineral water aquifers because it allows water to flow vertically through itself, deeper and deeper into the ground. This is because Basalt tends to have ‘pore spaces’ and is conducive to the creation of a saturated aquifer, due to basaltic lava’s highly fluid nature and its fine line of flow during the process of rock formation. It is also layered quite finely and intricately because while forming, these lava flows frequently overlap. Often, the empty spaces created by this overlapping rock structure are filled by soil, making the water filtration process even more rigorous. And this is how this unique elixir of life is nurtured by these mighty rocks, infused with essential minerals and salts, and prepared for your consumption over centuries and centuries of nature’s careful nurturing. All we at Komin do is, bring this natural mineral water right from these incredible ancient aquifers of the mystical Sahyadris right to your favourite supermarket or e-store!